Rudi Fronk and Jim Anthony, cofounders of Seabridge Gold, discuss the fundamentals behind gold and the markets. Gold is the ultimate safe haven, for two simple reasons. First, its total aboveground supply only grows 1.4% per year, no matter what anyone does (and even this rate of increase is starting to fall as production levels have peaked). Second, gold is final settlement for the payment of obligations; it is universally accepted as itself, in physical form, not needing to be translated into someone else's currency. In the current financial asset mania, with confidence in markets and central banks very high, markets are not much interested in safe havens and gold has been languishing. When investors become more risk averse, gold will go on its next big run. Current sentiment and market positioning correspond to what is typically a price low historically. But a future big move in gold, in our view, is likely to correspond to a reset of global debt. Since the financial crisis of 2008/9, central banks have attempted to avoid a deflationary collapse by driving interest rates down to 5,000 year lows. A wave of defaults has been avoided as nearly any company and asset can be financed at low rates no matter what the creditworthiness. 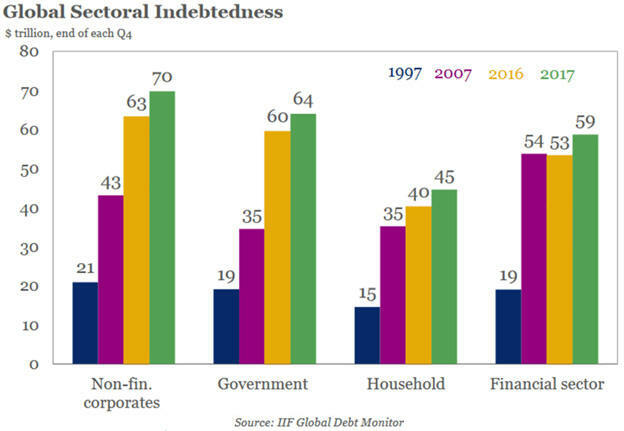 The result: a huge increase in debt, much of it of low quality. Over the last 20 years, the IMF estimates that global debt has increased from $74 trillion to $238 trillion while the global economy has grown at about half that rate, from $36.5 trillion to $79.6 trillion. This process is creating financial claims on the real economy that far exceed the increase in production of goods and services. Prior to 2007, the greatest rate of increase in debt was in the financial sector which, not surprisingly, became the epicenter of the crisis of 2008/9. Since the crisis, the greatest growth has occurred in the non-financial corporate and government sectors where we expect the next crisis will unfold. The underlying driver of the next collapse is likely to be the manic creation of financial claims against the real economy that cannot be met. Your loan is someone's asset. The owner of that asset expects to be able to realize its worth in the real economy. In short, the financial claims and the real economy must reconcile and achieve relative parity. Instead, they are moving farther and farther apart. There are now almost three dollars in creditor claims on the global economy for every dollar's worth of goods and services. The losers will be pensioners and savers generally because the coming reconciliation must result in a mark-down in the value of financial assets. Savings are deferred consumption but not deferred forever, as people retire. Here is the graph for the U.S; debt and GDP were roughly equal in 1970. 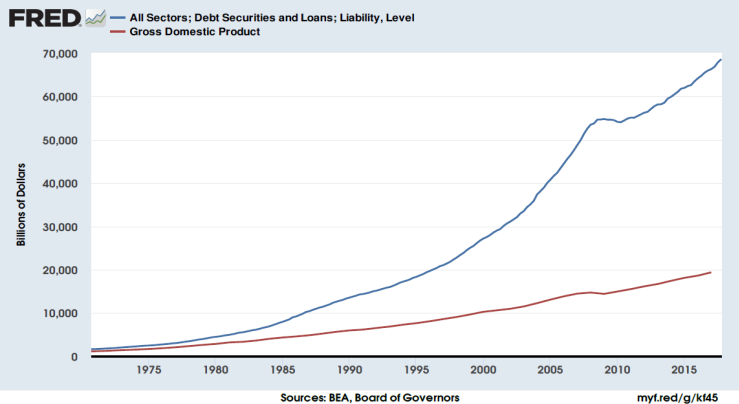 Since then, after Nixon left the gold standard in 1971, debt has grown three times faster than the economy. U.S. credit market debt is nearing $70 trillion against a $20 trillion economy that must support and service it. Note the brief slowing in credit creation in 2008/9 when an expected deleveraging was defeated by central bank Quantitative Easing. Unfortunately, growing debt has not underwritten accelerated economic growth. In fact, as debt has increased, its productivity in terms of economic growth has dwindled, probably due to the depressing effect of the debt itself. 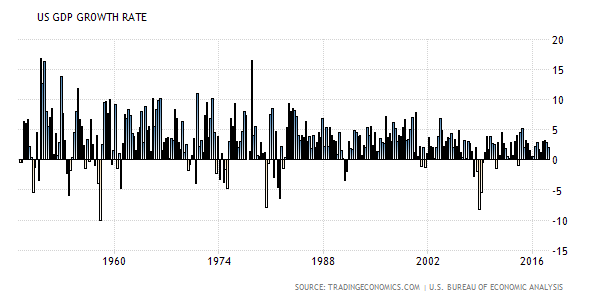 The following chart tracks real U.S. GDP growth per quarter. The steady downward trend is clear. The post war credit economy has lost momentum despite immense credit expansion and technological innovation. We don't know for sure how the Federal Reserve will reconcile the outsized financial claims on the real economy. Will they allow corporate borrowers to default as interest rates rise? Or will they prevent widespread defaults and inflate the currency instead? Either way, savers lose. We believe investors will try to preserve their purchasing power by crowding into the comparatively very small gold market (currently $6.5 trillion in aboveground supply). If we are right about a coming reset, where do you want your savings to be, in financial assets or gold?